Irish Cubist Painter, Stained Glass Artist, Biography, Paintings. An early example of non-objective art. The Irish Cubist painter and stained glass artist Evie Hone was born in Dublin. One of the earliest abstract painters in the history of Irish art, she was the great-great-great granddaughter of Joseph Hone, a brother of the portrait painter Nathaniel Hone the Elder RA (1718-1784) and father of two other portraitists Horace Hone (1756-1825) and John Camillus Hone (1759-1836). Struck by infantile paralysis, Evie suffered from lameness the rest of her life. After studying drawing and painting at the Byam Shaw School of Art in London, Evie Hone continued her studies at the Westminster School of Art under Walter Sickert (1860-1942), where she met her lifelong friend and fellow artist Mainie Jellett (1897-1944). From London, the pair continued studying in France, first under Andre Lhote, then under Albert Gleizes, the great Cubist theorist. At this time, Evie Hone concerned herself with portraits, landscapes and (increasingly) abstract pictures. Returning home, Hone and Jellett held a joint exhibition at the Dublin Painters Gallery, largely featuring their new and highly abstract art. The critics were not impressed with the non-representational qualities of the paintings displayed, and were baffled by their abstraction. 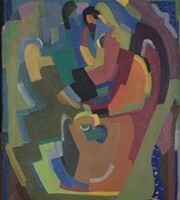 After a short break, Evie Hone continued studying with Gleizes. Both she and Jellett joined the Abstraction-Creation group of artists, who specialized in geometric abstraction - or, concrete art - and had their paintings published in the group's Parisian magazine. Both Irish artists then submitted their paintings to the Salon d'Automne, the Salon des Surindependants and the Salon des Independants. Evie also submitted to the Water Colour Society of Ireland (WCSI) and during the years 1930-1945 had more than 40 works displayed. Of these, roughly 15 were for stained glass. From hereon, Evie's main artistic preoccupation was with stained glass art. She first joined Sarah Purser's studio - the stained glass co-operative An Túr Gloine - before setting up a studio of her own in Rathfarnham and becoming influenced by the great Harry Clarke. (See also Stained Glass Art: Materials and Methods). Over the next twenty years, she undertook a number of commissions and left an impressive legacy of artwork in this genre. Evie Hone's most important works are the Crucifixion and Last Supper windows at Eton Chapel, Windsor (1949-1952) and "My Four Green Fields", now located in Government Buildings. Evie Hone was a founder member of the Irish Exhibition of Living Art (IELA). In 1958, University College Dublin staged a memorial exhibition of her Irish painting, drawing and stained glass designs, which attracted a record attendance. In 2005-6, the National Gallery of Ireland held an exhibition of her works. The auction record for a work by Evie Hone was set in 2005, when one of her stained glass masterpieces - entitled, Stations of the Cross, for Kiltullagh Church, County Galway - was sold at Whyte's, in Dublin, for €42,000.  For details of other abstract painters and sculptors, see: Irish Artists: Paintings and Biographies.  For more about modernist abstract artists like Evie Hone, see: Irish Art Guide.  For more about concrete art, see: Homepage.